Ryan Dening, concept artist and founder of North Front Studio started work as a model-maker and designer of theme park attractions before moving into concept art for games. He worked as lead concept artist on Star Trek Online then, following stints at Activision and Midway Games, moved to BioWare Austin to work on Star Wars: The Old Republic, where he became lead concept artist. 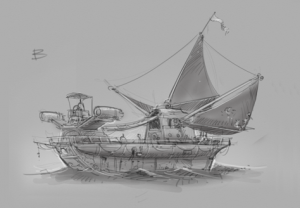 In this tutorial Ryan explores two concepts for futuristic sailing boats inspired by Chinese junk boats using Made with Mischief’s Mischief drawing app. 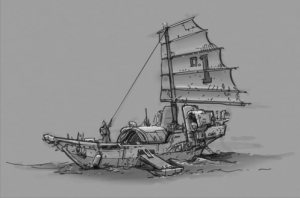 Ryan has provided his native Mischief file (NF_JunkSailShip_01-2_final.art) to explore. You can open the art in the free version of Mischief as well as the trial and full versions. He has also provided a layered version of the Mischief file (NF_JunkSailShip_01-1_layered.art) which can only be opened with layers in the trial or full version of Mischief. A free version of Mischief with six tools (3 brushes and 3 erasers), a basic palette of colors and infinite canvas is available for download. The full version of Mischief (US$25) delivers the full drawing experience including preset brushes and erasers, a full color palette with custom swatches, layers, and the ability to export PSD files. A 15-day Mischief trial gives you all the full version features for the trial period. Daniel is the Industry Manager for ArtStation.